A couple of weeks ago I was poo-picking the fields at work. The fencing is powered by a small energiser, and in order to pass from one field to the next I needed to turn it off. Now, my brain knows all about electric fencing. I knew not to touch anything metal on the energiser or cables, and I was careful not to brush against the fencing as I reached through. Unfortunately, due to being an idiot, I didn’t really give much thought to the earth spike. I was also wearing a wide-brimmed hat which compromised my peripheral vision, and so I didn’t realise how close I was to it. My forearm brushed against the earth spike just as my fingertips touched the crocodile clips on the battery, and I received an almighty shock. My first thought was that the clips were faulty and it was they that had given me a shock, but then common sense filtered through half a second later and I realised what I’d done. I berated myself and tried again, this time steering clear of the earth spike. However, ever since, I have found myself getting nervous when I reach for those clips to undo them. I know they didn’t give me a shock, I know that I won’t get a shock so long as I don’t make the same mistake again, and yet I can’t stop feeling worried about it. The weirdest part of this is that I have even given myself phantom shocks – where I imagine that I have received a shock when I touch those clips, even though I haven’t! My brain has even come up with the theory that the longer I’m touching a clip, the more likely I am to get shocked, and therefore I should do it as quickly as possible. Marty has a problem with food “resisting” when he takes hold of it, i.e. a haynet or an apple held for him to take a bite out of. Today he accepted a wadge of cleavers I’d picked for him (albeit with some tail-swishing, cavernous nostrils, and lots of staring), which was a quite a big deal for him! The whole sequence happened again today (in fact i phantom shocked myself twice, until I forced myself to get a grip and keep my fingers on the wretched clip), and as I continued with the poo-picking I started thinking about the way the mind worked and how illogical it could be. Picking up horse poo is a great place for thinking, as you know. My thoughts came round to mules (as they often do) and, in particular, Marty. I’ve spent a long time trying to figure him out so he is just a natural place for me to apply any new theories to. I thought about how I, as a human, have the ability to rationalise. I can look at an incident like getting that shock, and figure out what I did to get it and how to avoid getting it again. I know that it wasn’t me touching the clip that gave me the shock. But if my brain can do all that and STILL raise my heart rate as soon as I reach towards those clips – and make me feel pain that isn’t there – then what chance does an animal have? They don’t need to ruminate on the whys and hows; something hurts them, they avoid doing whatever it was that caused the pain. Simple. I thought about Marty’s concern over the halter. As I’ve said before, there is no apparent reason for this. I know his history and he has never been mistreated. He has been physically checked many times. It doesn’t matter what happens after the halter is put on or taken off, as I have tried every possible combination. 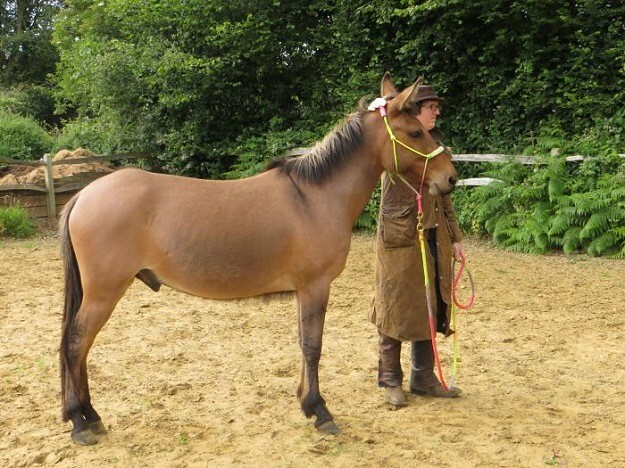 There hasn’t been an incident that involved his halter … or has there? I think I’ve spoken before about the idea of headaches or static shocks. 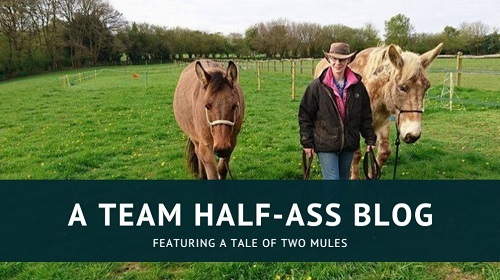 Could it be that during an otherwise uneventful haltering, something unrelated to the halter caused him discomfort – a static shock, a twinge elsewhere in his body, a bee sting? Can equines also create this “imaginary pain” but, unlike a human, are less capable of rationalising it? Could that explain why, at 7 years of age, Marty still becomes anxious about the halter and why in the past he has gone from bad to good to bad again? I can imagine that if he experienced an imaginary pain while being haltered, then this would just reinforce his belief that halters are the source of bad things. 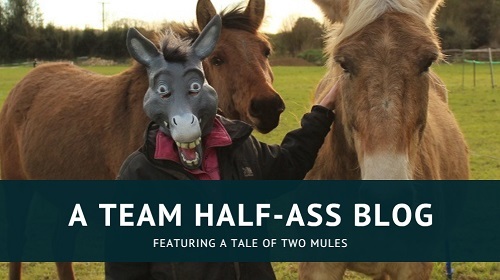 Mules are smart, but they also have a very strong sense of self-preservation. An old photo from when we were teaching him to have his feet handled shortly after we got him. Temple Grandin wrote about how horses and other animals think in visual associations. This is why a horse might be afraid of people wearing a certain type of hat, for example, because they associate that hat with a person or a situation in which they were afraid. I used to ride a horse who spooked every time we rode past a particular gateway for about two months, because there had once been a log lying there that had scared him. 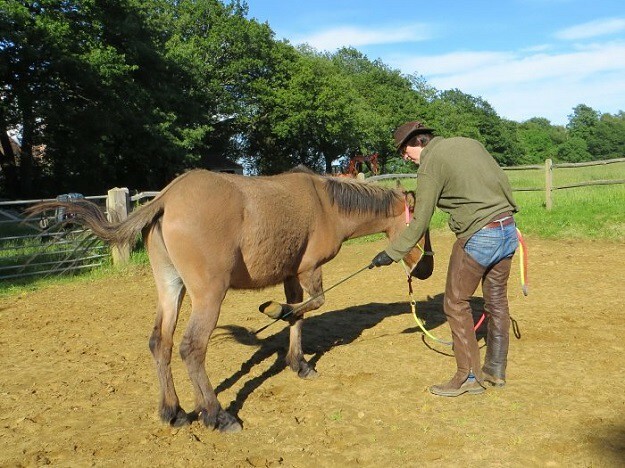 I also think visually, and it makes sense to me that if I can reach for those clips and receive an image of myself doing the same thing and getting an electric shock (and feel the physical as well as the emotional association), then perhaps a horse or mule can too. I’m just wondering if it’s not only an emotion but also a tangible response that is associated – i.e. the horse who once banged his hip on a stable doorway and now bolts in and out of his stable is feeling the actual pain of his banged hip as well as the fear it gave him. This then becomes a cycle of reinforcement. Another old photo, where we working on finding and increasing his comfort zone in regards to hands near his poll/ears. Another thing I am curious about is whether the way the pain is received has an effect on whether or not we (and equines) store it as an associated emotion/tactile sense. I recently had the heavy, hinged metal lid of a feed bin land on me as I leant in to reach some feed; my forearm, which I raised to fend it off, took the brunt of the blow. However, I don’t feel the same worry about accessing the feed bin as I do with turning off the field energiser. It’s certainly made me think twice whenever I lean in, but only in a “Did I make sure to secure the lid?” way. My heart rate doesn’t increase and I don’t feel any imaginary pain! Somatisation is when a mental factor, such as stress, creates a physical symptom. I feel like this is where fear comes in. When I received an electric shock, there were a few seconds when I had no idea what had happened. My immediate instinct was what I guess was the flight response (although I didn’t run, of course, because – much like a mule – I can appraise a situation for danger better than a horse can. I can just imagine my boss looking up and seeing me galloping away across the fields, arms flailing, shrieking incoherently…). Can a horse or mule make that visual association with something that caused them fear, and then experience the physical symptom due to somatisation? I know that we shouldn’t anthropomorphise our animals by applying our own behaiour and emotions to them. I also know that I can not take my experiences as an individual and apply them to others as fact. 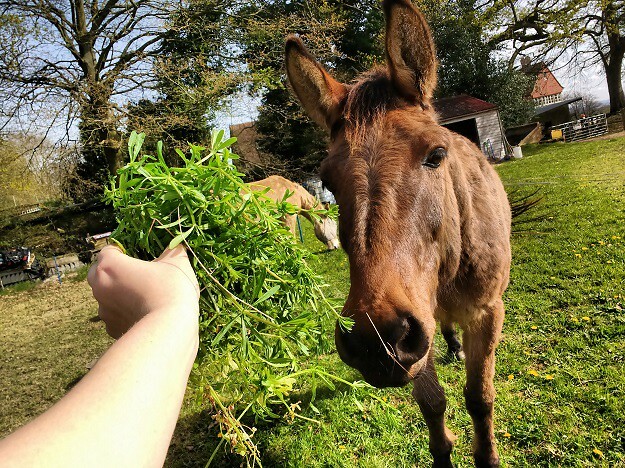 However, thinking of my mules’ odder behaviour in this context lends me a far greater empathy and understanding; a little like how Marty became much easier to work with when I began to think of him as autistic. Trying to understand the way my mules think may send me crazy in the end, but it is a fascinating journey all the same.